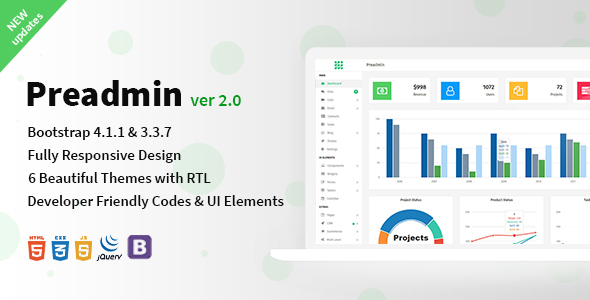 Preadmin is a fully responsive and packed both Bootstrap 3.3.7 & 4.1.1 admin template. It’s a lightweight and easy customizable multipurpose template built with the Bootstrap framework, the latest web technology HTML5 and CSS3. Preadmin is compatible with on all major browsers, iPad, iPhone, Tablet, Andriod mobiles and all other mobile devices. The template package comes with UI kits, Tables, Charts, Email, Video Calling, Voice Calling, Chat, E-commerce, CRM, Blog, RTL and many more.